A belief or desire for something to happen. A gift that can be given to yourself or others at no cost, and invaluable to its recipient. Something that can be stripped away much quicker than it was given, so holding on to it requires nurture and protection. Hope gives us something positive to focus on and put our energy and efforts towards until destiny comes along and declares its verdict. One thing I have learned is that Hope, like most things in life, is relative. There is always a reason to be hopeful, it’s just what you’re hoping for may have to change. Most successful relationships require flexibility, and life is no different. When I was first diagnosed, I hoped for 10 plus years of a happy and somewhat normal life. My biggest challenge at the time was how to balance building a future I wanted and was worthwhile, but not one that would be hard to let go of if I had to. Spending time with family and friends, leaving my footprint, trying to make a difference and living life to its fullest. Hope was easier to come by back then. As my disease progressed, my circumstances changed and so did my hopes. They shifted to something that felt attainable but still of value given my new situation. Don’t get me wrong, sometimes it was a struggle, but eventually I found my way there. You see, there’s always hope. Sometimes we just have to turn down the noise to find it. 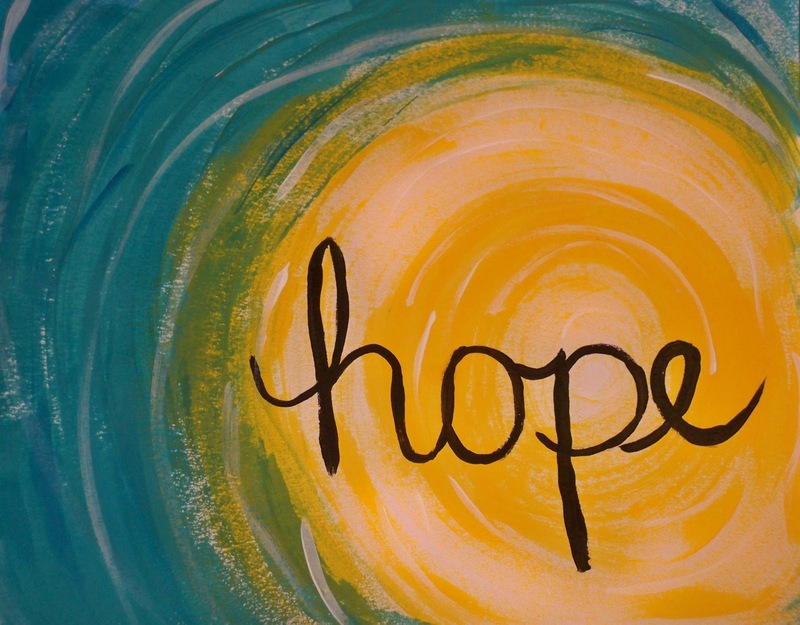 For me, finding hope wherever I could since my diagnosis has always been a priority. A priority because the hope I find and foster isn’t just for me. It’s for my family. For my friends who are vested in me as if I were their family. To ease their worries and fears, giving them something to look forward to and watching their hearts lighten just enough to make them smile as they see signs of it. That’s what is most important to me. There’s a fine balance between accepting reality and preparing for its possibilities while still maintaining hope. Preparing for the worst but still hoping for the best. Right now, it’s the best gift I can give them. Hope, similar to laughter, is contagious. If you can find it for yourself, you will be able to give it to others and that is a blessing. A blessing for yourself and those around you. But is hope enough? I don’t think so. A physical reaction to express a positive emotional state. A contagious emotion, when shared it binds people together. It lightens your plate, letting you forget your worries for a few seconds. I’m fortunate to have been raised in a home where we were silently taught the importance of laughter. Silliness was and is something you can always find in the Doshi households. Growing up I didn’t realize how something so simple would be so important in my life. I’m blessed to have had a best friend, a sister, who took it to the next level with me, as we learned, a little too easily, how to laugh at things that weren’t remotely funny. The worse the situation, the harder we would laugh. Laughing out loud without thinking the other one was crazy. Making the good times better and the tough times easier. I’m lucky to be surrounded by family and friends who know how to laugh, regardless of the circumstance. Even if they are simply laughing at how ridiculous it is that I can’t stop laughing. Laughter is a snapshot. A snapshot of happiness that heals your soul and lightens your heart. Creating space, space for hope to fill in. Hopeful laughter or laughing hopelessly, these days it’s hard to tell the difference. Probably a bit of both. To me, hope and laughter are critical in our lives. For all the reasons above, plus what they enable us to do. The two together help us appreciate what we have and find our strength for what may lie ahead. I’m grateful for my amazing family and how resilient we are. I’m grateful for my family and friends and all that they do for me. I’m grateful for my job that allows me the opportunity to work with friends towards something we believe in and the flexibility to do so given my circumstances. I’m grateful for the generous souls who donate their blood and platelets to keep me going. I’m grateful for the lessons I’m learning and the strength I have found when I needed it the most. And I’m mostly grateful for the hope I’m able to find and the laughter that comes so naturally. Getting up every day, doing things that will give hope to my loved ones and sharing laughs along the way – that is the best gift that I can give to my family and friends. The best gift I can give myself. Beautiful image and description of Hope. Thank you for refining what hope can mean to us. This entry was posted on March 16, 2015 by youcanmakemestronger in Story and tagged gratitude, hope, hope and laughter, laughter.